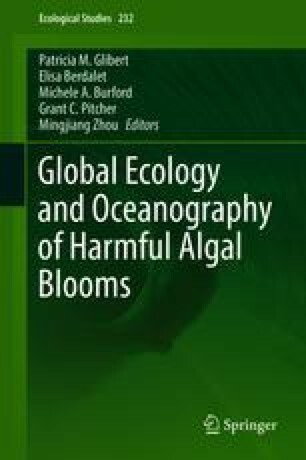 The Global Ecology and Oceanography of Harmful Algal Blooms (GEOHAB) Programme was established in 2001 under the sponsorship of the Intergovernmental Oceanographic Commission (IOC) of UNESCO and the Scientific Committee on Oceanic Research (SCOR). GEOHAB was the first international research programme focusing exclusively on harmful marine algae. The GEOHAB mission was to foster international cooperation to advance understanding of HAB dynamics and to improve our ability to predict these events, with the final aim to inform and facilitate management and mitigation of the associated negative impacts. GEOHAB focused on the physiological, behavioural, and genetic characteristics of harmful microalgal species and the interactions between physical and other environmental conditions that promote the success of one group of species over another. A hallmark of GEOHAB was that it championed a comparative approach, across organisms, regions, and ecosystems. GEOHAB advanced our understanding of the mechanisms underlying population dynamics of HABs within an ecological and oceanographic context and also from the ecosystem perspective at the regional scale. GEOHAB encouraged combined experimental, observational, and modelling tools using existing and innovative technologies in a multidisciplinary approach. This deliberately integrative and multidisciplinary framework was consistent with the multiple scales and oceanographic complexity of marine HAB phenomena. One of the legacies of GEOHAB was that it established the basis for continued international efforts to better understand and predict the complex global phenomena of harmful algal blooms, leading in 2016 to the follow-on effort, GlobalHAB, which will continue and extend GEOHAB’s mission. Patrick Gentien was deceased at the time of publication. We thank the many participants who have contributed to GEOHAB over the lifetime of the programme and in particular the 36 Science Steering Committee members who provided their time, ideas, and enthusiasm to make GEOHAB a success. Funding, programmatic support, and guidance were provided by SCOR, IOC, and IPHAB with significant support from the US National Science Foundation to SCOR for GEOHAB (Grants OCE-0003700, OCE-0326301, OCE-0608600, OCE-0938349, and OCE-1243377), US National Oceanic and Atmospheric Administration, and the European Commission. Support for completion of the document was provided by the Ida Benson Lynn Endowed Chair in Ocean Health and NOAA ECOHAB award NA11NOS4780030 to RMK and by the OstreoRisk project (CTM2014-53818-R) to EB. This is NOAA ECOHAB contribution number 922.